I have an affliction, I call it fishing ADD. Let me explain. When I am out on a charter, I want to catch them all. I want the grouper, the snapper, the mackerel, the sail fish, the dolphin – all of it. We all know that by targeting one group of critters you have the best chance for success. That is why I love it when the north wind starts to blow. It gives us the opportunity to target a very wide variety of species with just a few different rigs, and working just a small area of our real estate. When we are chumming, and we are always chumming when fishing the reef, we have a great chance of getting a school of ballyhoo in our chum line. As these baitfish are blown out over the patch reefs, we can set an ambush. Catching a bait well full of these pointy nosed critters becomes top priority. The best way to load up on this bounty is to throw my cast net. As with any ADD sufferer, I simply can’t wait for bait to show up. Especially when we are near perfectly good fishing bottom. In previous years, we would be hoping for one of the many species of grouper to show up. However with the ban on grouper during the winter months in Keys waters, (January 1-April 30) we have had to adjust. Fortunately there are always snapper to target. If we had to choose between mangrove, mutton, and yellow tail it would be a tough choice. Fortunately with regards to the snapper, it’s easy, pick them all. As long as we are on the patch reefs, on the top of the reef line, we have an equal chance in picking up any or all of these fish. On this part of the reef, the techniques for catching these snapper are one and the same. Soak a small live pinfish on the bottom with a minimum of leader (about 20 to 30lb test) and just enough weight to hold bottom. (Around ¾ of an ounce usually works well). Or even better is fresh dead ballyhoo. We use a plug of about half a fish with head and tail removed. A 4/0 short shank hook will work for the widest variety of reef fish. Once the ballyhoo show up and get within netting range we change gears and clear enough of our fishing lines out of the way to have a clear shot to get a net full of ballyhoo into our well. It pays to be a little extra patient here as the ballyhoo often will not give us back to back throws with the net. They have a better memory than many people give a dumb animal credit for. It often takes up to an hour for the ballyhoo to get back within throwing range so it really pays to be sure that we wait for the best chance of filling the well on the first throw. With live ballyhoo on board we can target the entire water column. We put a short trace of wire on our leader and are able to land arguably one of the tastiest fish in Keys waters, Cero mackerel. Ceros can simply not resist a struggling ballyhoo. The ceros usually make their presence known with a rather dramatic skyrocketing attack on your ballyhoo school. It is not uncommon for these fish to clear twenty feet of water on one jump as they blast through the bait fish. These toothy speedsters are an underrated species. They are also one of the most misidentified of all of the mackerels. They bear an uncanny resemblance to the Spanish mackerel. This resemblance is an external resemblance only. There flesh is more reminiscent to that of the groupers than of any other mackerel. The meat is snow white and has fattiness like that of a grouper, not the darker oily flesh like that of the Spanish and King mackerel. To differentiate between the two species you need to look at the markings on their sides. The Spanish mackerel have round dots on their sides while the ceros have a series of dashes. By fishing the live ballyhoo in mid water or on the bottom, we have a greater chance at wide variety of fish, from mutton snapper and grouper to yellowjack and mackerel. Even though we have been fishing the bottom for snapper for a while, with the live ballyhoo in the mix we now have a renewed shot at wary and larger fish. It sometimes even surprises me at the size of yellow tail on the patches that take advantage of our live offerings. Once the action dies down and there are enough fish in the box for a nice dinner or two, I point the boat south and work out a few miles. Here I set up shop in blue water and either drift or slow troll with the live ballyhoo. Again this is perfect for someone like me with fishing ADD. We never know what will be attracted to our ballyhoo. 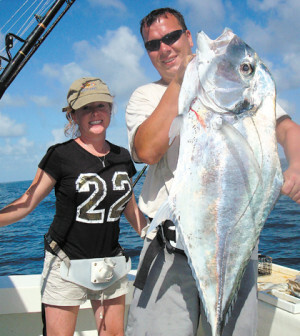 On most days we have a shot at sailfish, dolphin and blackfin tuna. If we are getting cut off a lot by king mackerel, wahoo or barracuda we have to put a trace of wire on our offering. While the wire does not deter many of the dolphin, it will greatly cut down on the sailfish and all but eliminates the tuna bite. Rigging for the slow troll is simple. I just use a long (at least 6 feet of 60lb) piece of fluorocarbon with a circle hook wired to the bill of the ballyhoo. When fishing mono to fluorocarbon I use an Aquateko InvisaSwivel Fluoro-Clear. These full strength fluorocarbon swivels are sometimes the difference between a fussy fish eating and refusing. This can also give you a head start on the late afternoon tuna bite. If you are like me and suffer from a case of Fishing ADD you might like to give our method a try and just do it all. Fishing ADD I want to catch them all. I want the grouper, the snapper, the mackerel, the sail fish, the dolphin – all of it.